Fusion’s all the rage – try classical and Argentinean, a la Ginastera. Alberto Ginastera was an Argentinian composer who wrote in the classical style that was influenced by south American melodies and rhythms. He studied with American composer Aaron Copland and later, served as a mentor to famed Argentinean tango composer Astor Piazzolla. Ginastera wrote operas, a couple of ballets, chamber music, several works for orchestra, several concertos for harp, piano, violin, and cello (anyone know if these are these widely played? I’d love to hear these), choral/vocal pieces, organ pieces, film music, and solo piano music. 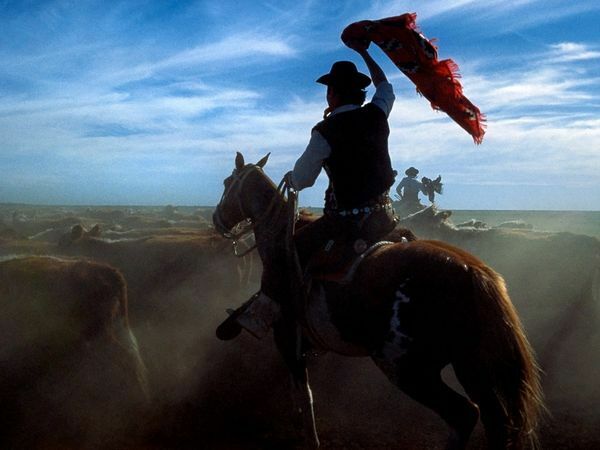 A frequent source of inspiration for Ginastera was the Goucho, the landless native horsemnn of the plains, a common symbol of Argentina. This influence shows up in Danzas Argentinas (Argentine Dances), Op. 2. It’s made up of three short movements: I) Danza del Viejo boyera (“Dance of the Old Herdsman), II) Danza de la moza donosa (“Dance of the Beautiful Maiden”), and III) Danza del gaucho matrero (“Dance of the Arrogant Cowboy”). It’s a vibrant, rich suite, with the opening piece steely and tense; the second, heartbreaking and mysterious; and the last, full of crashing chords, to be played basically as loudly as possible. I learned these dances for my Associate of the Royal Conservatory of Music diploma. The ending, which has some glissandi – a couple of superfast gliding of the fingers on the keys – are real cuticle-shredders. It was a logical choice to feature Argentine pianist Martha Argerich. Her fiery playing style and impeccable clarity is highlighted in this work. Alberto Evaristo Ginastera was born April 11, 1916 in Buenos Aires and died June 25, 1983, in Geneva, Switzerland.